• Get back at ne'er-do-well next of kin by blowing $381,000 of their inheritance money on a coffin. • Make outgoing calls in case of accidental burial (hope it's Verizon). • Gold gives your pallbearers a much better workout than mahogany, or a pile of ashes. 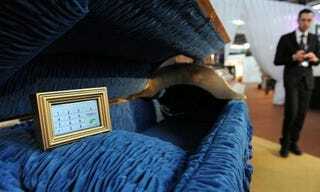 • GPS-equipped phone makes tracking down grave robbers a cinch. • Be the envy of your fellow undead during the inevitable zombie uprising.